Hello peeps. It's going to be a super quick one from me tonight I'm afraid as I've had a day full of meetings and I am utterly cream crackered. I just want to share with you the card I made for this weeks Copic Colour Challenge. We're sponsored by Stretch n Bubbles and the DT got to play with some of their images. This little birdie was perfect for this weeks colours - YG03, C7 and Y17. I'm currently making a bag for my friends birthday present so I added a bit of stitching to this card whilst my little Janome was out. Still love the effect it gives. 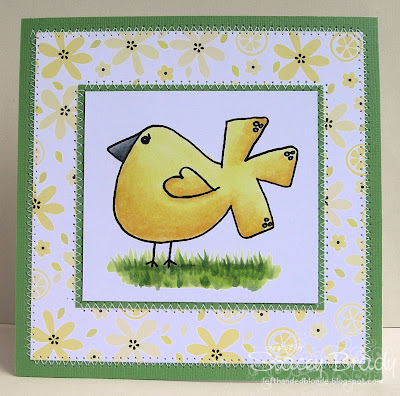 Because of the stitching, I can also add this card into this weeks challenge over at Stamp with Fun. Paper: Pink Petticoat free kit. Copic Markers: YG03, YG63, YG67, Y15, Y17, Y21, C3, C5, C7. OK, thats all from me today. I'll be hopping in to my lovely bed soon! Oh well, only 1 more day at work until I have 3 days off! Woo-hoo! Yellow and Green...love it...and all that delish stitching Stacey! Super cute card Stacey! Perfect for the lead up to easter! Love your stitching too! Enjoy your days off! So super CUTE Stacey and your coloring is AWESOME! Wow what a happy sunny card..just what we need to look at in this awful dreary weather..almost made me feel warm for a mo..It is absolutely spot on as usual stacey, your colouring is fabulous! Great card, I love the stitching - it just finishes the card perfectly. I really like the bird image too, he's so different.